Update August 2014: Since Eagle Pack changed all their formulas to include peas, I am now looking for a different food. I don't want to use it for intact dogs who may be bred. I still think it is okay for pets who are spay/neutered. I still use mostly raw food but do include some kibble for variety. At this point brands include Holistic Select and Fromm Four Star in various formulas (not grain free), Fromm Gold Adult have been my kibbles of choice. I do use Eagle Pack Original since it has less peas than the Power Formula that was my go to dry food for almost 20 years. UPDATE SEPTEMBER 2018: I am also using Nutrisource Adult, and Performance (not the grain free formulas.) I really like this food! Right now my main brands/formulas of choice are Nutrisource Adult, Holistic Select Anchovy, Sardine and Salmon, Fromm Gold, and Eagle Pack Original. I still feed mostly raw, but these are the kibbles I use in my rotation. The big key is to look for foods without a lot of fillers, and with meats and whole ingredients as the first 5 ingredients on the list. Many people can't feed raw, either due to lack of time to do the research to learn how to, or they can't afford it or the time it may take. That's okay, you can still feed your dog fairly well with the various quality dry foods on the market. Expect to pay about two dollars or more a pound for good foods. Most of the really good foods are as much as three dollars a pound. Using good ingredients isn't cheap! Also, some of the brands that have a lot of advertising put more money into that than quality ingredients. Some of the best foods will not be widely advertised. Most can be found at the better pet stores, rather than discount stores, grocery stores, feed stores and such. Look for brands with no soy or wheat, or fragments such as brewers yeast. Also avoid ones with "mystery meats" such as "meat byproducts" or "meat meal" in favor of foods that list whole meat sources like beef, chicken or lamb. Mystery meats may include all kinds of nasty things including euthanized pets, road kill, rotting meats and worse. Finding a food with meat as the first few ingredients is very important, especially if you are not going to feed any real meat. Even the very best foods are still half grain, and with dogs being carnivores, they don't need that. Definitely avoid the dry foods with food coloring, semi-moist bits or other "funky" things. Just because there are pictures of vegetables, wholesome cuts of meat or other items on the bag, does NOT mean the food contains those same healthy ingredients. I also recommend avoiding treats with the same, the semi-moist, artificially colored stuff like the snausages type treats, fake bacon types and so on. It is soooo bad for dogs! I also included a list below, of foods to avoid. Another thing to do is watch how your dog does on the food. Does he eat it well, have a nice small, firm stool, and does he thrive on it? Does he have goop in his eyes, dirty teeth, dry or irritated skin, loose or smelly stool? All of these are signs of poor nutrition. If you do have to switch foods, take your time. Mix the old kind in with the new kind for several days or a week. This is because processed food lacks the digestive enzymes that would be found in fresh, raw food. The dog's body must learn to manufacture the correct enzymes for whatever kind of dry food he eats, and that takes time. This is one of the drawbacks of feeding a diet of dry food only, as it does deplete the body over time, since the body must constantly make enzymes. Fresh, raw food has all the necessary enzymes for proper digestion, so doesn't stress the body. This all has a positive effect on the immune system. Even if you can't feed raw all the time, adding it as you can is better than none at all. Any food that has food fragments like brewers rich, soy flour, "meat" by products as thos can legally contain anything inlucluding road kill and shelter pets that are euthanized. The low priced foods often sold at feed stores, farm stores and grocery or super stores like Wal-mart. These may include store brands or name brands that are the low quality end of the line of foods. Because the company has a long history of fairly frequent recalls, I personally don't use or recommend any products made by Diamond including their Premium line, Taste of the Wild line and all others. These brands are not going to help your dogs maintain the best health and condition they can, since they are just not made of the kinds of ingredients to support that level of health. I use and recommend adding probiotics on a regular basis (even if you only feed dry food.) Most of a mammal's immune system is in the gastrointestinal tract, so keeping that healthy goes a LONG way toward overall health. Most products come in the form of a powder you add daily to meals, or at least a few times a week and especially in times of stress. If you ever have to give antibiotics for any reason, adding probiotics daily is recommended. Two brands I use are Forti-Flora which comes in single serve packets, and a formula I buy online called Gentle Digest. UPDATE - I MADE A WHOLE PAGE DEVOTED TO RAW FEEDING, WHICH HAS A LOT MORE DETAIL THAN I LISTED BELOW. THE PAGE IS CALLED "FEEDING A RAW DIET" AND THERE IS A LINK ON THE LEFT HAND SIDE OF THE PAGE, NEAR THE TOP. These Aussies are excited by their raw diets! This is to be an introduction to the concept of feeding raw foods. It shouldn't be taken as a sole guide, as it's hard to cover everything in just a small article. If you are considering feeding your dog a healthy, balanced raw diet, it's good to study a variety of sources and find the method that fits your dog or dogs best. Also, part of your menu will depend on what kinds of foods you can find in your area, and that may vary depending on what part of the country you are in. Why would an owner choose to feed raw over the commercial, processed dogs foods? To me, the answer is simple. It's healthier. Processed food loses a lot of it's nutrition. Some of the cheaper foods are made from horrible ingredients (you wouldn't want to know!). Processed food has lost any beneficial enzymes. Their bodies become depleted. Raw food, on the other hand, has all the necessary enzymes to digest that particular type of food, and doesn't deplete the body. Rather, it enhances health and well being. Fed in proper balance, I believe it's the best you can do for your dog. Their teeth stay cleaner (I never have to brush my dogs' teeth yet they are nice and white, even in middle age). They build up more muscle in their heads by chewing their meals. They ENJOY their meals far more, though they aren't picky and would eat just dry kibble. I enjoy preparing their meals more since I feel good feeding them the best I can. The general rule of thumb with amounts is to feed daily about 2% of your dog's body weight. That will vary widely depending on your dog's weight, activity level, age (growing pups may need 5% or more), and so on. Watch their weight and stools and adjust accordingly. Many people feed raw and quality dry kibble, and if you do so, it's ideal to feed separately. I feed raw in the AM and kibble in the PM, most days. Since raw foods digest faster than kibbles (dry dog food) I feed them separately, and for me feeding raw in the AM works since I feed the evening meal closer to the morning one. Feeding the dry in the evening means there is a longer time to digest it before the next morning meal. You can start your puppy on raw foods fairly young. I recommend using the pre-ground mixes such as those sold by My Pet Carnivore, until the pup has enough teeth to chew whole pieces. You can sometimes find raw foods for sale at the smaller, upscale pet stores though I recommend avoiding ones with veggies added as they often give pups diarrhea. My pups wean onto the fine ground whole animal products from MPC. The first whole pieces I give my pups are chicken or duck necks, since the bones are smaller and softer. I give one and see how it goes. You can add small bits of muscle meat or organ too, but it's VERY important not to feed too much meat without bone, as dogs, growing pups especially, need calcium in the right balance. Trying to mimic the ratio of meat, bone, organ and so forth from a prey animal is ideal. I buy almost all of my raw food supplies from My Pet Carnivore out of Indianapolis. Their site is www.mypetcarnivore.com I've gotten good at finding sources, and of course I buy in bulk, and store it in a couple large freezers. Buying in bulk saves time and money. I may thaw bulk frozen supplies just enough to repackage into smaller amounts, that I thaw daily in the refrigerator. I use a plastic cat litter pan (new) to hold it, to keep juice from dripping all over. It fits in the bottom shelf just fine. I add salmon or fish oil supplements to improve the coat, and it seems to dramatically cut down shedding when they are grown, as well as give them a healthy coat and skin, and a stronger immune system. I get it at Meijer in the people vitamin/supplement section, though you can buy it at other place supplements for humans are sold. I give a puppy 1 of the 1000 mg capsules on their food around 3 times a week. I don't pop it open, just add it whole in the meal and they generally eat it. You may want to wait until the pups are about 10-12 weeks old to start this, and start gradually. I also give probiotics a few times a week, either Forti-Flora or Gentle Digest. The salmon or fish oil is also good for the immune system, as well as the coat, skin and joints. I often get asked how to switch a new puppy to a raw diet, so I thought I'd include my thoughts on the subject. I also have a more detailed section on the RAW FEEDING page. I start my new pups on raw right after getting them. I often do or recommend is to start adding just a small amount of raw food to the puppy's regular diet. This amount may be the size of a boiled egg yolk or even an egg, depending on the pup's age. Just to have an idea, we'll assume the pup is about 10 weeks old. Each day I may add just a little more, while decreasing the amount of other food. I watch the stool to make sure they are digesting it properly, and if so I keep adding quantity and variety. I should note that at this age, a pup can't handle bigger bones such as whole turkey necks or turkey neck pieces, so I often use the complete ground form of raw which includes meat, bones and organs that I buy from My Pet Carnivore. As the pup grows, I will add whole cuts, starting with small things like duck necks, and build up to bigger cuts like turkey necks. That wouldn't be until they get their big molar teeth in at 5-6 months of age. I do give organ meats and other smaller stuff from early on though. As always, the BIG key to feeding a healthy raw diet is VARIETY OVER TIME. You can't just feed meats and call it balanced, but the dog MUST have digestible bone included, as well as organ meat, raw green tripe and other parts that have connective tissue. Just take it slow and soon your pup will be happily eating a balanced raw diet! Also, once they are doing well on raw, if you want to still use kibble it is ideal to feed raw in one meal, and kibble in a separate meal. Since they digest at different rates, that's the best way to do it. The interesting thing here is the picture on the left is of a 7 month old pup and the dog on the right is 7 years old. Both have eaten raw food since they were pups. The only difference is a bit of yellowing on the 7 yr old dog's teeth. He has never had his teeth brushed nor cleaned by the vet. Chewing through his raw food is all the tooth cleaning they need. Below is the same older dog at 10 years of age, and his teeth are still clean with nothing more than chewing raw food, especially turkey necks. It should be noted that clean white teeth are not just appealing cosmetically, but are much healthier for the dog. The bacteria that can build up on dirty teeth can get down in the dog's blood stream, via the digestive tract, and over time can cause organ failure and even contribute to premature death. Many owners have to have their dogs' teeth cleaned by the vet, a procedure done under anesthetic. That comes with it's own risk. 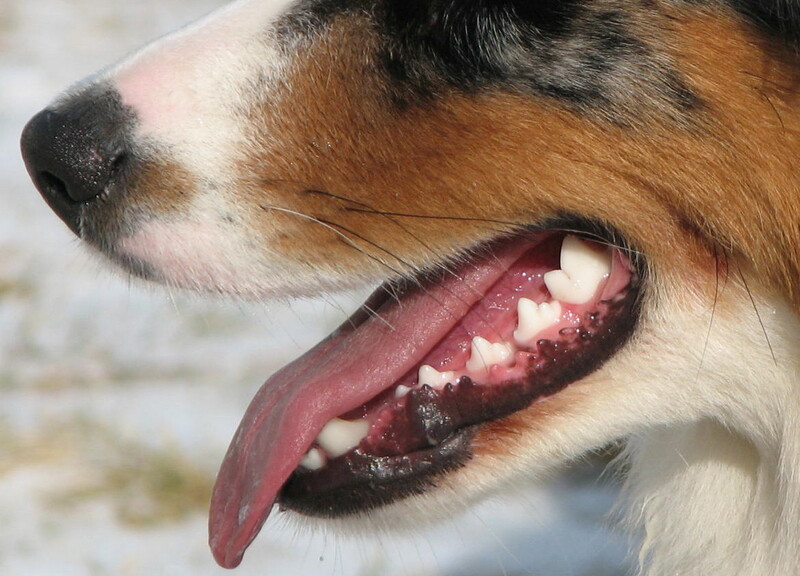 Some vets will even have to start the dog on antibiotics before cleaning the teeth, as a precaution for the bacteria that the dog will swallow once it's knocked loose from the teeth. To me, a HUGE benefit of feeding a raw diet, is being able to avoid all that.